The goal of the Library Resources block is to improve student access to library collections and services by promotion through Moodle, a starting point for many students engaged in coursework. The Library Resources block automatically displays on the side of all Moodle course sites, adjacent to course content. Content within the block is generated dynamically, and is tailored to the specific Moodle course that the student has logged into. The Library Resources block provides convenient access to course textbooks, librarian recommended research databases and journals, the library catalogue, and more. Remember, the content of the Library Resources block will change depending on what Moodle course you are logged into. We value your input! We'd love to hear what students and faculty think about the Library Resources Moodle block. Please use the form below to share your thoughts. 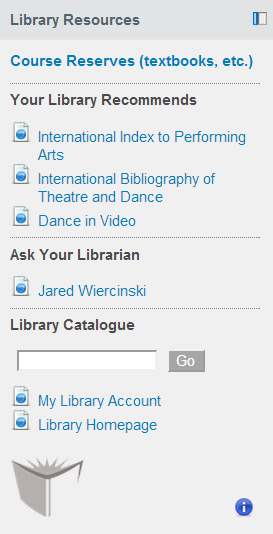 I'm a faculty member and I'd like to add the Library Resources block to my Moodle course site. How do I add it? The Library Resources block is added automatically to all Moodle course sites. How do I move the Library Resources block to a different location? First, you'll need to "Turn editing on" using the option in the upper right-hand corner of the screen. Then place your mouse over the Library Resources block; your mouse pointer will change to a crosshair. Now you can drag and drop it to a new location. How do I delete the Library Resources block? First, you'll need to "Turn editing on" using the option in the upper right-hand corner of the screen. Then, click on the red "X" in the upper section of the block. Who makes the recommendations listed in the "Your Library Recommends" section? The recommedations are provided by professional librarians who are specialists in specific subject disciplines. I'm a faculty member and I'd like the Library Resources block to display specific content for my class. How can I make a suggestion to have the content changed? We value your input. Please use the feedback form to send us your suggestion. I'm a faculty member and I'd like to use the library's Course Reserve service to make course material available to my students. How do I do that? You can learn more about the service through our Guide for Faculty.